When you want to take advantage of the robust and reliable expression that’s possible from the AAVS1 Safe Harbor Site, SBI offers a series of HR Targeting Vectors (also called HR Donors) that already have homology arms specific for the AAVS1 site. 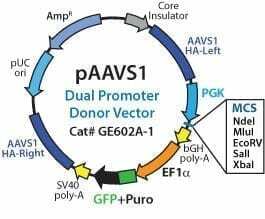 Simply clone your gene or miRNA of interest into this first generation AAVS1 HR Targeting Vector—pAAVS1D-PGK-MCS-EF1α-copGFPpuro—and co-transfect with Cas9 and gRNA delivery constructs, such as our All-in-one Cas9 SmartNuclease & AAVS1 gRNA Plasmid. Delivering consistent, robust transgene expression, the AAVS1 safe harbor site is a preferred target for gene knock-ins. Insertion at the site has been shown to be safe with no phenotypic effects reported, and the surrounding DNA appears to be kept in an open confirmation, enabling stable expression of a variety of transgenes. The pAAVS1D-PGK-MCS-EF1α-copGFPpuro AAVS1 HR Targeting Vector features dual GFP and Puromycin-resistance markers driven by a constitutive EF1α promoter, enabling easy monitoring of successful recombination by GFP fluorescence, as well as rapid selection for integration using the puromycin antibiotic marker.